Off the Beaten Path: Who's Calling the Moves? Do you have a GPS? A Global Positioning System? Nifty little gadgets, huh? 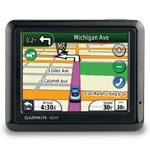 Once you've used a GPS such as a Garmin, pictured below, you wonder how you ever got anywhere without one. Not only does this small device, which can be held in your hand or mounted to your windshield or dashboard, map out the way you should travel to get to your desired destination, but it will even verbally guide you. Funny how sometimes we long to hear a knowledgeable and confident voice telling us exactly what to do - turn left at the next intersection in .2 miles, marry the man in the blue shirt, buy the Honda Accord, choose Dr. Sebastian to deliver your baby, invest in Coca-Cola - but other times we do our best to shut out all voices offering direction - don't eat that third chocolate chip cookie, exercise five days a week, put your credit card in the freezer, you don't need another new purse, get out of bed! Last week when I was in Texas, my friend Kim and I occasionally used a Garmin to get around. For the most part we already knew where we were going. We usually do. But there were a few times, such as when I had a sudden craving for IHop pancakes one morning, when we pulled out the little black rectangle and invited it to tell us where to go. Kim's GPS has a male voice and her daughter has named it Jonathan. At first I liked Jonathan. He helped us find an Off the Border Mexican food restaurant when I was having one of my cravings for chips and salsa. He spoke calmly and with firm assurance. He knew how to get to the restaurant and shared his knowledge kindly with us. Jonathan navigated our way around Dallas, Mabank, Gun Barrel City, Tyler, and Canton. Or he tried. The problems began when Jonathan seemingly became confused about our many locations. He didn't know where we were starting from. We would be in Dallas looking for an IHop and he would direct us to the loop in Tyler. Or we would be searching for a movie theater in Tyler and he would insist on taking us to one in Fort Worth. I became angry with Jonathan. Kim told me to turn the Garmin off. She knew how to get where we were going, she said. And I'm sure she did. But I wanted Jonathan to get on board. I wanted him to wake up and realize we were no longer in Tyler, but in Dallas. He kept "recalculating", but to no avail. I wanted Jonathan to give us good advice like he had a few days ago, but now he was stubbornly out of touch. I think that's what happens when we depend too strongly on others for advice. Let's face it, we all have the ability to give some good advice now and then. I can recommend some great restaurants, tell you how to make a few super pasta dishes, correct the grammar in your essay, and give you a few tips about hiking. But if you ask me how to discipline your child I'm probably going to tell you to take away their cell phone - advice that won't do you a lot of good if you're referring to your 4 year-old (then again, in this day and age, maybe your preschooler has a cell phone to take away!). And if you ask me which dress you should buy, I'm going to suggest you go with the classic gray one that has flattering lines but a modest neck. After all, I'm in my 40s, I have a sixteen-year-old daughter, and I need to lose 10 pounds. In other words, I'm probably going to tend to give you advice based on where I'm at in life, not necessarily where you are. Like Jonathan, I might neglect to recalculate before I start doling out directions. That's why the very best directions are always found in one reliable source. The Bible. Funny how the oldest book around never has to recalculate before it offers direction. You might think it should, considering the changes in times and cultures and such. But if you read the Bible responsibly with some good study tools under your belt, you'll find that every piece of wisdom offered in its pages is just as relevant today as it was when it was first written. Coupled with humble prayer, the Bible has the unique ability to accurately point the way every time. I have a few things I've been seeking advice from others on right now. To be real honest, I've gotten mixed answers. It's occurred to me that each person is kindly and honestly directing me from their own perspective. Their calculations are based on their own knowledge and experience, not necessarily on what's best for me and what I'm doing. Well-intentioned, but not necessarily best. So, while I'll keep their advice in mind, I'm going to turn to a more reliable source for direction at this point. I'm going to try something novel and yet tested and true. I'm going to pray about it, asking God to direct my path. He knows exactly where I am, no need to recalculate. And He knows exactly where I'm going. So instead of getting our my Garmin, I'm opening my Bible. And instead of listening to Jonathan, I'm listening to Jesus. His voice may not be as easy to hear, but I've no doubt He'll speak up when I start really listening. Hey! You have a great day. And if you're going somewhere and listening to that stilted little voice in your Garmin, be sure to give him (or her) time to recalculate your position before he starts offering advice. It's a handy little device, but it's not infallible you know!